I'm all about fine dining with beautiful linen napkins and crystal stemware, but there is something so satisfying about sitting down at a newspaper-covered table with a big bushel of blue crabs and a bucket of cold beer in front of you. You roll up your sleeves, pop open your beer, grab a crab, and make sure you have a roll of paper towels nearby. 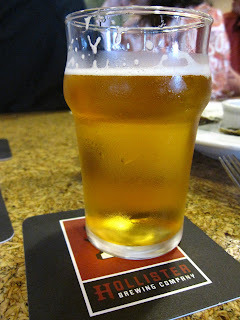 So when I was invited to a seafood and beer pairing dinner, my vision was rather low-brow. But I forgot one important detail. The chef behind the dinner was Dylan Fultineer, one of the most inventive and eclectic chefs I've been exposed to. He's like a magician or chemist, concocting dishes with seemingly disparate ingredients that rationally could only be the result of some sort of culinary dare, but he somehow makes them work. But not just work. Your mind is blown. Since Dylan left the Hungry Cat earlier this year, I've been mourning the loss of his ridiculously creative and delicious dishes that make you feel like you've just won the lottery. Currently calling Hollister Brewing Company home, he may have shifted to a more gastropub repertoire, but these monthly beer pairing dinners give him a chance to get back in the kitchen and do what he does best: Create off-the-chart dishes using the freshest local ingredients. But in typical Dylan fashion, he's not just serving memorable food. He's reeducating you on the pleasure of eating. His new partnership with self-taught and award-winning brewmaster Eric Rose seems to be a match made in heaven. Both are part artist—part scientist, working together to create an integrated dining experience with as much focus placed on the beverage as the food. The result, quite frankly, knocks your socks off. No stranger to tasting menus paired with wine, I've come to appreciate how just the right glass of wine can elevate a dish from good to flawless. But beer . . . hmmm. . . I can't say I've ever really given it much consideration as a transformative element to eating. But after my seafood and beer pairing at Hollister, I'm a believer. Not your most adventurous beer drinker, I was a little skeptical. Stouts, creamy ales and smokey beers often leave me wishing for a wine list, but like good pairing should, once I tasted the beer and the dish together, I wondered aloud what combination could possibly be better? I do feel compelled to comment on the dessert because I know it seems whacky. I don't have a massive sweet tooth so an olive oil cake is an ideal finish. This cake was fluffy, moist, slightly fruity, delicate and leans almost to the savory side of the dessert scale. 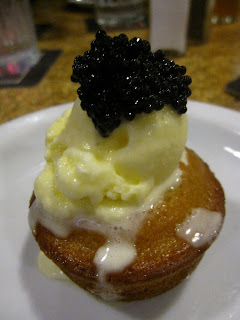 Accompanied by a lovely little scoop of creme fraiche ice cream, with a sublime tanginess, and topped with a dollop of caviar . . . . I know! Bizarre! But insanely delicious! You'll have to trust me on this one. I'm not even a huge fan of caviar [and I call myself a foodie?! ], but this was the most stunning combination of the evening, only perfected by the wheat beer I washed it down with. With the widespread availability of craft beers and the fact that beer offers a broader range of flavors than wine, it needs to be more than a secondary thought when considering what to drink with your meal. [For ideas on pairings, look here.] My introduction at Hollister definitely made me a convert. I'll definitely be expanding my beer pairing beyond pizza and burgers. I might even serve it with cloth napkins! And in today's economy when you're perhaps less inclined to reach for Robert Parker's latest 94-pt choice, craft beer should be considered the new affordable luxury.